One teacher used a unique social deduction game to build a unit on the Salem Witch Trials that also taught students empathy and systems thinking. This fall, I read an article in The Atlantic extolling the virtues of the social deduction card game One Night Ultimate Werewolf. Summarizing this instructive video about the game, each player draws one role card from a deck. Each role has a prescribed action that is taken during a "night round." In the center of the group are three additional cards, turned face down. One by one, different roles "wake up" (open their eyes) and perform actions that may include swapping cards or peeking at other players' cards. While the game's box includes a script for a game moderator, the free mobile application is recommended. Using it, players are instructed to close their eyes. Once the night round ends, everyone wakes up and has five minutes to lie, bluff, and accuse others of being a werewolf. Shortly after discovering this article, I saw on Twitter that teacher and Gamindex founder Mallory Kessen had been using the game's bluffing mechanic as a discussion strategy tool in her English language arts class. One Night met Common Core State Standards for supporting argument claims with evidence. As a game-using social studies teacher, I decided that I wanted to bring the game to my students. First, I purchased it and played at home with my family. What I discovered was a light (playable in under ten minutes), easy-to-learn, fun game with a high replayability factor -- when we played, we wanted to keep playing over and over! I decided to integrate One Night Ultimate Werewolf as the centerpiece for my seventh-grade social studies unit on the Salem Witch Trials in Puritan Massachusetts. The learning goals included historical empathy for being falsely accused. First, I would have students play; next, they could reflect on how they felt accusing others or being accused themselves. Here, One Night's mechanic of bluffing aligned with the learning goals: accusations and historical empathy. Learning from game experiences is meaningful. However, I wanted to go farther. I designed a project-based learning unit that would challenge student teams to remix the One Night role cards and mechanics to teach about the Salem Witch Trials. I also contacted the game's designer, Ted Alspach, to learn more about how it works. To Alspach, the Troublemaker role was what differentiated his game from other social deduction games. The Troublemaker's action is to switch two players' cards. "It was the one role that has made the game fun to incredibly compelling," he says. "Now, anyone -- with the exception of the Troublemaker -- can be a werewolf, regardless of what they started as." Alspach next shared how he would approach the design challenge of making a Salem-themed game. "[The accused at Salem] were not 100 percent sure if they were innocent of what they are being accused of," Alspach says. "They did something that really wasn't witchcraft but was perceived as witchcraft. There was a that little bit of uncertainty." It was the uncertainty of player role identity that would ultimately hook my students. Rollout of a game-based learning unit is often key to effectiveness. First, I had three students play One Night Ultimate Werewolf while the class watched. Then five students played (the game is for 3-10 players, perfect for a class setting). When the whole class reconvened, I detailed the project's requirements. Students engaged in a lively discussion of how it felt to be accused of being a werewolf. Then the topic switched to the accused witches in 1692 Salem. Finally, students played One Night again, this time with eight players. Like Alspach's game, students were prompted to have all actions take place in one night. Therefore, a script with a wake-up order would be required. Deciding these actions required playtesting and higher-order thinking. Students were given a paper template indicating Role, Action, and Why? For example, the Abigail Williams character might be similar to One Night's Troublemaker because she instigated accusations. Therefore, her actions (switching other players' cards) might be similar. Students had a list of characters from Arthur Miller's play The Crucible. Most groups asked if they could create more than the rubric's required nine roles. Teams added mechanics to their games as well. One group included a judge role to hear the accused plead their cases. Another team added a mechanic to John Hale, one of the witch accusers. His role was to reveal another player's cards. Regarding resources, I mixed in different levels of texts, from graphic novels to above-grade level material, including Miller's play. Additionally, I included Salem resources from Stanford History Education Group's Reading Like a Historian curriculum. I wanted to give students choices to move in their zone of proximal development. The students worked in teams of four. The design challenge was to have players experience a feeling similar to those in colonial Salem. They were graded based on artifacts from their projects (e.g., game prototypes, rules, the moderator's script with role wake-up order). Furthermore, students had to keep a daily "designer diary" to track their individual contributions. Alspach’s designer diary of One Night Ultimate Vampire was shared with students as an example. They also had to playtest others' games and offer feedback. During the project, several students asked me to read the moderator script or to play. I politely declined -- I wanted them to take full ownership of the experiences they designed. 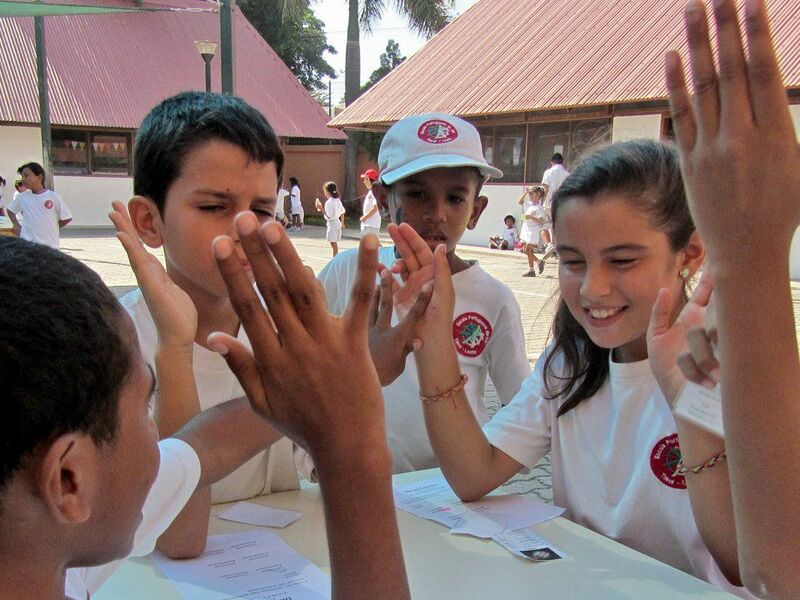 By the last day of the project, students were calling across the room, "Who wants to play our game?" There was a sense of intrinsic pride because they'd taken the design challenge. Games are effective at teaching the 21st-century skill of systems thinking -- how parts of a system interconnect. Like the people in 1692 Salem, students learned that every cause has a consequential effect. Alspach explains it best: "With One Night, there's a cleverness going on. Am I smart enough to figure out what's going on here? Am I smart enough to deceive all of these clever people at the same time?" How have you used game design in your classroom?